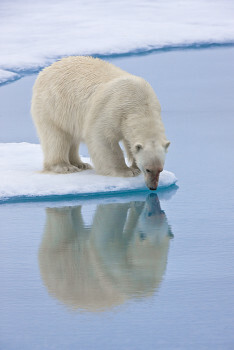 Like I mentioned in my previous blog, I learned three distinct life lessons from the Polar Bears. 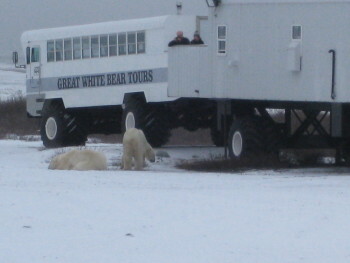 On my recent trip to Churchill, Canada, I saw these animals in the wild, and I couldn’t help but notice how their behavior can be adapted to our everyday life. Last week, I talked about focusing on your goal – relentlessly. Well, today, the second lesson I’m going to share is: Stand Your Ground. But here’s how I see it. You’ve decided on a goal, you’re passionate about it, you’ve thought it through and you can describe it down to the last detail. In fact you can feel it in your bones. You can see it, smell it, taste it, and you live for it every single day, working toward it with a vengeance. When you share your vision with someone – a friend, family member, anyone who will listen – their reaction isn’t exactly what you expected. They may doubt you, question you, and even worse, cause you to lose belief in yourself. Without even realizing it, you begin to reevaluate your goal. You wonder if it was such a good idea in the first place. You question if this is the right direction for you. 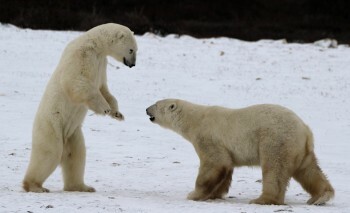 And that is what I learned from the polar bears – STAND YOUR GROUND. Because the bears are left to their own devices to survive, they must have a belief in themselves that is beyond doubt. They stand tall and move forward, never losing sight of their goal. So, don’t be frightened by what others think, and don’t feel like you have to justify anything. Stand up tall, and in the face of diversity, show how powerful you can really be. Have a belief in yourself, in your goal, and tell the world that it cannot be shaken. For the first time since I started my blog, I did not post one last week. That’s because I was off on my dream trip – one that I waited 15 years to go on. It all started when I attended a travel show in Chicago back in the year 2000. One of the booths offered a trip to Churchill, Canada, where you live on the snowy tundra of the Hudson Bay and watch polar bears as they make their way to the ice. You live on something that resembles a string of train cars, raised about 10 feet in the air, so it’s safe to view the bears as they walk right past your “lodge”. I took one of the brochures, and for some reason, I became obsessed with this trip. Has that ever happened to you? You can’t explain it, but in your gut you feel that there’s something you have to do – and you just can’t give up on it. Well, for some reason, that was the polar bear trip for me. During that 15 year span, I moved six times and downsized each and every time. I recycled old magazines, donated clothes and sold furniture, but for some reason, that polar bear brochure stayed with me. And now I have finally planted myself on that icy tundra of the Hudson Bay for one week and watched the polar bears, day and night, pass below my window and observation deck. I have to admit, that after all that waiting and build-up anticipation, the trip did not disappoint. It was exciting, exhilarating, and beyond my expectations. I learned some fascinating life lessons from the bears. I’ll share three of them with you in my next three posts. You’ll read about unique survival techniques that only Mother Nature could teach us. Survival techniques that we can use each and every day.